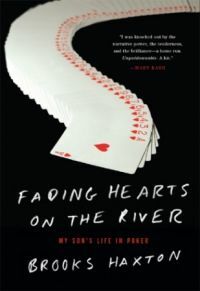 Centered around multi-million dollar stakes and a series of nationally televised poker tournaments, Fading Hearts on the River offers a story of odds—the odds of a newborn surviving severe jaundice, the odds of Congress passing a law that renders one’s online gambling income inaccessible, the odds of drawing the right card on the turn or the river. In this tale of fatherhood and worldy success, Haxton follows his son Isaac’s unlikely career as a poker player, the nervous father often sitting on the sidelines with his fingers crossed or staring at a casino monitor while Isaac wins more in one hand of play than Haxton has earned from all his books of poetry combined. In this deftly crafted story Haxton explores the propensity for abstraction, logic, and memory all good poets and poker players share, all the while taking readers on a rollicking tour of complex, intertwined topics, ranging from game theory and financial strategies, to medical mysteries and lost love, to chess, Magic cards, and Texas Hold ‘em. Guided by the through-line of a father’s love and admiration for his talented son, Fading Hearts delivers a unique perspective on professional gambling and one family’s experience playing the odds.